Damn, I forgot about that story I was told from the same guy. Kara, during an official visit recruiting dinner, had one (or twelve) too many drinks and made a racist comment in front of one of the recruit's mothers and some wives/girlfriends of other coaches. The mother immediately said something about it and then asked to be taken back to the hotel. So, yes, what you claimed is a very real possibility of happening. I wonder if she'll be a repeat offender when her husband gets canned by Texas State. lets hold the applause for february... withers (everett or kira) and tyler jones mom still have 8 months to do something silly to cost us some key recruits...until then as im constantly reminded it is merely a tug-o-war. or who is to say woods or mooring doesnt split before the 2019 season because it seems to have been trending as that may come as a shock to some of you. 100% agree. It's nice and all to see recruits verbally committing to the program now, but it doesn't matter one iota until they actually sign on the dotted line. La Porte’s Devin Henderson and Sterling’s Calvin Hill. It's the offseason and before camps... It passes the time. "Hey, kid. We want you to come play at Texas State. Hopefully, the next staff who will be coaching you wants that also." 5 for 5 in 3* commits to begin the 2019 class. I don't think we've ever done that. Also, I'm not sure I've seen a verbal commit recruit as much as Brysen McKinney has been doing. We've had others tweet a few things but almost very one of them indicating a texas state offer, he's responding to them to join. It does help when current commits help, especially if they know them. 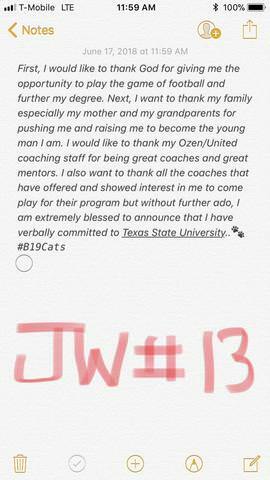 I would think Jalen Wells knows current TXST Bobcat CB Jarron Morris. One other thing to consider with the current class we have is that many of these seniors to be were likely the first group of players as sophomore/juniors that this coaching staff saw as camps 2 years ago so they know many of them from those camps and/or from last year's camps. My point is that having some time with these players may be paying off. Damnit, I came back to see more crying about a kicker not read good news. We need more crying on here! 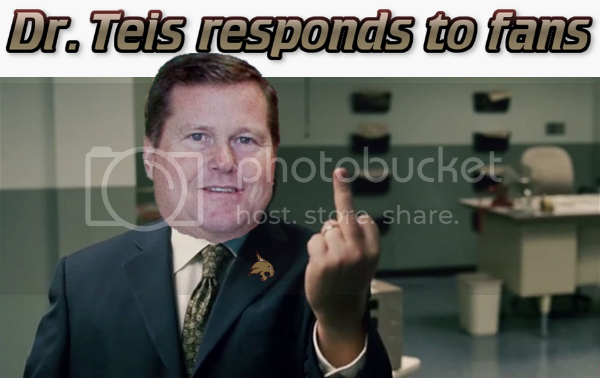 Good news about Texas State football? Where've you been the last few years? The only good news surrounding the program will be when the contract is bought out. Oh, and the correct word is "dammit." Damn it works as two words, but it's "dammit" if you're using one. Stick around; you'll learn a lot. Also, I'm not sure I've seen a verbal commit recruit as much as Brysen McKinney has been doing. Yeah I really like McKinney so far solely based on his social media advocacy of the program. I may even check out a Mansfield Summit game or two this fall if I can. Damnit, I new I was bad at speling.